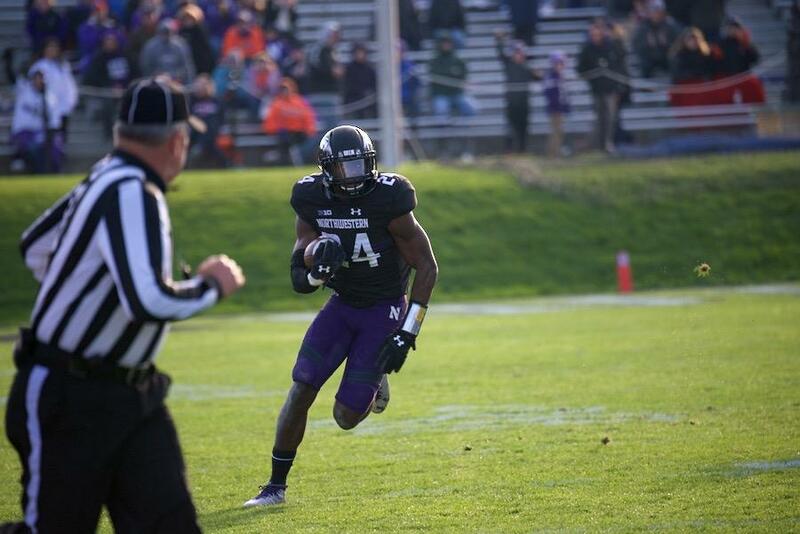 Montre Hartage returns an interception. The sophomore's fourth quarter pick was his fifth of the season. Montre Hartage had been picked on all day by Illinois quarterback Wes Lunt, struggling to contain a determined passing attack that romped for 377 yards. Then, with 11 minutes left in the fourth quarter, the ball dropped right into the sophomore cornerback’s midsection and he wove and cut back across the field for a 66-yard interception return, ending the game on a positive note. It was turnovers like that — Illinois (3-9, 2-7 Big Ten) committed four, and the Wildcats (6-6, 5-4) converted all four into touchdowns — which, time after time, flipped the tide in the home team’s favor Saturday. The first turnover came early in the second quarter, when Illinois receiver Malik Turner fumbled after catching the ball. Three plays later, NU scored its third touchdown, which ultimately proved the difference in the 21-14 halftime score. The second turnover denied the Fighting Illini an opportunity to get their own third touchdown and level that score. Running back Reggie Corbin was fighting for extra distance inside the 10-yard line when junior linebacker Anthony Walker stripped the ball moments before Corbin’s knee touched down. A 95-yard fumble return was called back for a penalty, but the Cats’ offense still found the end zone shortly after, extending the lead to 28-14 on a massive momentum shift. The third came on a punt return after Illinois had converted on NU’s lone turnover to cut the deficit to 28-21, and again cost the Fighting Illini a chance to put together a drive while trailing by only one score. Returner Darius Mosely had already dodged several tackles when he coughed up the ball on a hit from sophomore J.B. Butler, setting up a Cats touchdown drive that increased the lead to double-digits permanently. And the fourth essentially sealed the result, with Hartage’s interception return to the 5-yard line leading to the third touchdown of the day for junior running back Justin Jackson and a 42-21 lead. Given Saturday’s plus-three turnover margin, the Cats are now 4-1 this season when they record a positive turnover differential, with the lone loss coming against Illinois State — a trend not overlooked by the team.